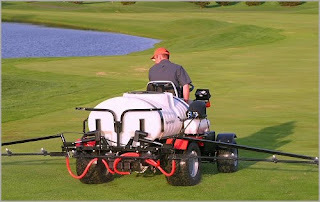 PGR's or Plant Growth Regulators are used on many turf areas of the golf course. The primary reason for using PGR's is the obvious, to regulate the vertical growth of the turf. Besides the benefits of having the turf grow slower the PGR's allow the turf grow more horizontally with increased rhizome's and stolons creating a more dense playing surface on greens and fairways. Some of the other benefits of applying PGR's are as follows. The overall decision on applying PGR's is a difficult decision weighing the cost of the product verses the amount of labor saved from mowing less frequently.